Happy New Year 2012 and thank you for all your visits! Below is the last few months of blog visits. A total of more than 62,000 visits over the last year and 386 visits per day during the busiest day! In the last few months I was very busy with work and didn’t update enough of my blog as often. I hope with next semester I can spare more time on updates of my blog, open-source software libraries and hardware designs. It is going to an exciting year. I plan to make some devices for teaching labs, and I have a new and upgraded interface library to roll out in a few days to unite all libraries such as buttons, matrix keypad, analog buttons, rotary encoders etc. Please keep tuned! 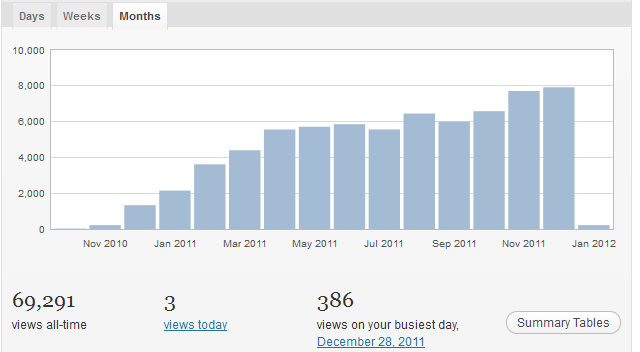 In case you want to know the visit per month in December, it was 7,919, or 255 visits per day!